Hyderabad is one of the fastest grown IT hubs of India. It is known as “City of Pearls”. It is a capital city of two states, i.e. Telangana & Andhra Pradesh. Hyderabad city was formed in 1951 by Muhammad Quli Qutb Shah. Hyderabad is also known for its educational facilities. Students from all over the country come here to study higher education in the field of engineering. As per the recorded census 2011, the overall literacy rate of Hyderabad is 83.26%. 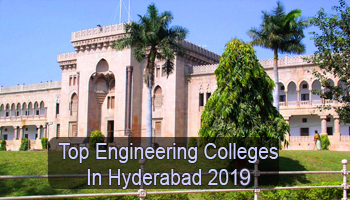 In this article, candidates check the list of Top Engineering Colleges in Hyderabad 2019 including exams, admission process, specializations, etc. At sarvgyan.com, we have listed the top engineering colleges in Hyderabad for the academic session 2019-20. The list is comprised of all the deemed, government, private & autonomous institutions, including Indian Institute of Technology (IIT). On the basis of several factors, we have rated all the listed colleges after a complete research. These factors are national importance & reputation, academic excellence, building and infrastructure, student’s preferences, facilities provided by the college, placement cell services, advanced technology education, etc. The admission to the B.Tech & B.Arch courses in Hyderabad city will be based on JEE Main score. Candidates, those seeking admission to the IIT Institution, they have to qualify JEE Advanced examination. Candidates will also apply for AP EAMCET & TS EAMCET examinations to get admission into engineering courses. For admission to the B.Tech (LE) course, candidates must appear in AP ECET & TS ECET exams. Some of the reputed universities will organize its own entrance test for providing admission to B.Tech programme, i.e. BITSAT, VSAT, GITAM GAT, etc. The admission to the PG engineering course will be done on the basis of GATE scorecard. The top disciplines/specializations of engineering courses, which are preferred by the students are Electrical Engineering, Computer Science & Engineering, Mechanical Engineering, Information Technology, Civil Engineering, Electronics & Communication Engineering, Aeronautical Engineering, etc. If you have any other queries about Top Engineering Colleges in Hyderabad 2019, you can ask us by leaving your comments in the comment box. I got 48300 rank in ts eamcet 2018 and in interIPE got 92.2% i wanted to do b. Tech (CSE) which colleges is best for me in 2nd phase counseling. My son got EAMCET rank 70119. How much fees will be there in each college ? And how much scholar ship will get us ? I would like information about good engineering colleges in TS / AP.